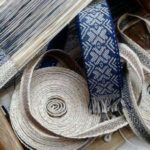 Edric Ong and Jungle Arts & Flora present Textiles of Borneo Cultural Show, Lecture and Trunk Show in support of sharing Malaysian artisans and their legendary works. This cultural presentation will be held on Friday, July 20th, from 6:30pm – 8:30pm with a special lecture on Fiber Arts of Borneo – Tradition and Innovation. We will have video of fiber arts happening in the villages of Borneo. Senia Jugi will dance to recorded Iban music and Edric will share draping skills with some “volunteer” models using various scarves and sarong textiles. There will be traditional Malaysian wall hangings, baskets, scarves, sarongs, jewelry and videos for sale as well as appetizers and drinks for all ages.